Another brunch... yes but a good one! 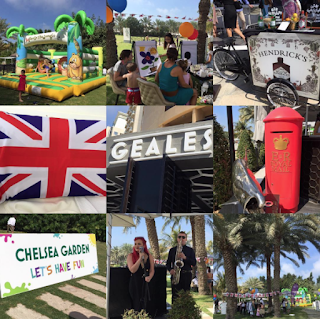 We had a great time last Friday at Geales New Family Friendly ‘Posh Nosh’ Brunch, located in Le Royal Méridien Beach Resort & Spa. Loved the British theme with a modern twist. The food was delish. On the menu: some favourite British Classics. Four courses of Geales’ signature dishes are served at the table to share, alongside an impressive selection of British inspired beverages. First to the table is the deliciously light signature Duck Live and Chicken Pate on Brioche, followed by The Tower of Geales, a chef’s selection of fantastically fresh seafood including, Fine De Claire Oysters, quintessentially British Prawn Cocktail, Mussels, Crab Legs and homemade sauces – the ultimate seafood platter. Next, are the hot appetisers including Haddock and Dill Bon Bons served with Jalapeno Mayonnaise, right through to Juicy Lamb Ribs with a minted glaze and Scrambled Egg, Asparagus and Grilled Rye Bread. Followed by main courses, Sirloin of Beef accompanied with roasted vegetables, Braised Shoulder of Lamb served with creamy Mash Potato - our favourite! Amazing! Very good home style cooking. 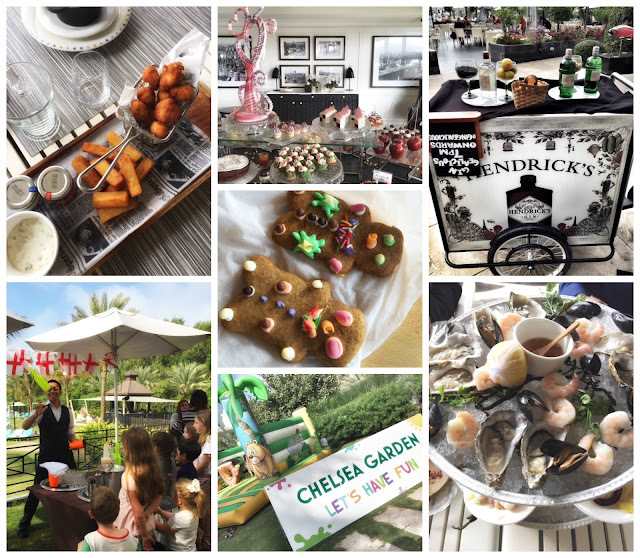 While you enjoy the Geales Urban Seafood and Lounge experience, little ones are in the "Chelsea Garden"- being entertained - activities include the classic face painting, art classes, a bouncy castle, cookie decorating...with space to run around on the lawn. Happy kids! - Cool British vibe with modern twist. - Four courses of Geales’ signature dishes are served at the table to share - not overwhelmed by a massive buffet very well curated selection of good food. The Posh Nosh Brunch is served every Friday from 12.30pm – 3.30pm at Geales, Le Royal Meridien Beach Resort & Spa. The ‘Posh Nosh’ Brunch is priced at AED 440 including a selection of alcoholic beverages, AED 290 including free flowing soft beverages and AED 90 for children aged from 9 to 12 years inclusive of soft beverages and those below nine years are free of charge.